One of our ongoing concerns here at Fine Books is the intersection of books and art. In the midst of a digital revolution in publishing, I would like to start profiling small, independent publishers who produce fine editions of their books; those who relish in the artistic possibilities of the codex and create the collectable books of our age. This new, occasional series begins today with Scarlet Imprint, a “talismanic publisher” in England who has been producing beautiful editions of occult works since 2007. Operated by Peter Grey and Akistis Dimech, Scarlet Imprint was the first ever occult publisher to be shortlisted for the Book Design and Production Awards for their fine edition of XVI. But Scarlet Imprint is on a broader mission than simply producing beautiful books. 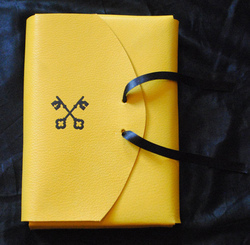 As their website reads, “We are committed to the fine book arts and the magick that can be bound into the book itself. 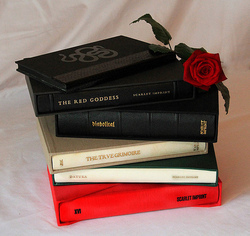 Books are living things which can be consecrated and brought to life in order to manifest change in the individual who engages with them, and the wider world.” In addition to producing fine editions in limited print runs, Scarlet Imprint also publishes paperback and digital editions of its books under its Bibliotheque Rouge imprint. NP: What was the genesis of Scarlet Imprint? PG: Scarlet Imprint began in order to publish Peter’s book The Red Goddess, in a talismanic edition of 156 copies. We accomplished that and sold the copies largely through word of mouth. Howlings emerged from our work with the Goetia and was our next offering. NP: What is the publishing vision of the house? PG: We intend to inspire and fuel the magical revival. We publish both established and respected writers and the radical young voices. 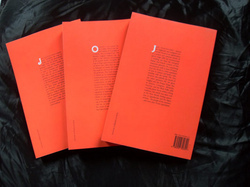 We take risks with the material we publish, for example the poetry anthologies, as these are works which would not otherwise see the light of day. In this way we hope to raise awareness of the importance of creativity and craft in magical praxis. As a truly independent publisher we do not belong to any group, order or organisation. All paths can lead to knowledge, and a willingness to share, discuss and engage with others seems appropriate to the times we find ourselves in and the tools we have at our disposal. NP: Could you tell us about the process of producing your fine editions? PG: You could see the fine editions as a way to manifest and convey the spirit of a book without the usual constraints. We have a very good relationship with our binder, as well as with artisans in leather and marbling, which has allowed us to explore the possibilities of expression in the medium of book binding. Naturally, the themes and spirit of a work direct and inspire the outcome. These are magical objects, not simply the standard edition with a leather spine. Every edition of our titles exposes a different facet of the spirit of the book itself. NP: How do you decide on your limitations for each print run? PG: Choosing limitation numbers is based primarily on the magical requirements of the task at hand. NP: Could you tell us about Bibliotheque Rouge? PG: Bibliotheque Rouge is our propaganda wing. It references the bibliotheque bleue period where grimoires and other books were printed and distributed to the mass market, resulting in an explosion of interest in the occult arts. We do not believe in creating artificial scarcity. In a digital age, with the free flow of information, it is backwards to think otherwise. The world has changed. Though we feel that there is something particularly magical about the creation of books as objects of enduring beauty there are students who want the raw data and cannot afford either fine bindings or luxurious hardbacks. We want the information to reach people, regardless of the depth of their pockets. NP: How do you feel about the idea of “grimoire scalping” (borrowing the terminology from the recent post at the blog Balkan’s Arcane Bindings) -- that is, people purchasing your fine editions solely to sell them at a profit soon after they’ve sold out from the publisher? PG: We do not suffer from this to the extent that other publishers do, as our books are neither self-consciously ‘dark’ nor cynically limited. Our readers are our friends and peers who will rarely part with our fine editions whose value is not in their price alone. We will also take payment in installments and reserve books when necessary so that our readers do not miss out on a book they have set their heart on. As a problem we think grimoire scalping is overstated, the number of serious practitioners out there in the fine edition market is very small. Those who buy fine editions specifically for resale can be easily blacklisted, although this does not entitle anyone to conduct a witch hunt, as books do come to market for legitimate reasons. People are going to be out to make a quick buck and act opportunistically. Such are the supposed values of our culture. NP: I know that XVI was nominated for the 2011 British Book Design Awards. Could you tell us about that? PG: We are the only occult publisher to ever be shortlisted. This shows that the artistry of our books is recognised beyond the narrow confines of genre. The bookbinders, artisans and printers we work with all deserve due praise. Our typography, design work and harmonious use of materials are acknowledged as superlative by those whose stock in trade is books. However, we do not seek mainstream or industry approval for the work that we do. The book industry is simply that, an industry, looking to sell more product in a collapsing marketplace. As artists we have a very different agenda. Books for us are living things that create change in people and in the world. NP: What’s next on the slate for Scarlet Imprint? PG: We prefer to play our cards close to our chest, but we can say that the next open objective is our Pleasure Dome festival in Brighton on July 21. At the Crossroads is our latest title exploring the new magic occuring as Western Magic enters into a fusion with the diaspora religions. Ever more wild, challenging and radical texts are in development. Expect the unexpected. This new, occasional series begins today with Scarlet Imprint, a "talismanic publisher" in England who has been producing beautiful editions of occult works since 2007. 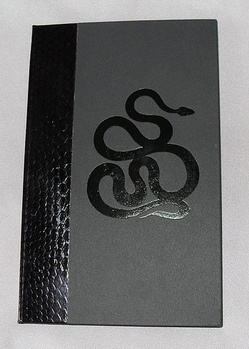 Operated by Peter Grey and Akistis Dimech, Scarlet Imprint was the first ever occult publisher to be shortlisted for the Book Design and Production Awards for their fine edition of XVI. But Scarlet Imprint is on a broader mission than simply producing beautiful books. As their website reads, "We are committed to the fine book arts and the magick that can be bound into the book itself. Books are living things which can be consecrated and brought to life in order to manifest change in the individual who engages with them, and the wider world." In addition to producing fine editions in limited print runs, Scarlet Imprint also publishes paperback and digital editions of its books under its Bibliotheque Rouge imprint. PG: Scarlet Imprint began in order to publish Peter's book The Red Goddess, in a talismanic edition of 156 copies. We accomplished that and sold the copies largely through word of mouth. Howlings emerged from our work with the Goetia and was our next offering. NP: How do you feel about the idea of "grimoire scalping" (borrowing the terminology from the recent post at the blog Balkan's Arcane Bindings) -- that is, people purchasing your fine editions solely to sell them at a profit soon after they've sold out from the publisher? PG: We do not suffer from this to the extent that other publishers do, as our books are neither self-consciously 'dark' nor cynically limited. Our readers are our friends and peers who will rarely part with our fine editions whose value is not in their price alone. We will also take payment in installments and reserve books when necessary so that our readers do not miss out on a book they have set their heart on. NP: What's next on the slate for Scarlet Imprint?